In the present work, two wild microorganisms were studied for saccharification and fermentation. A wild Acinetobacter pittii isolated from decaying cladodes (Opuntia ficus-indica) was capable of producing extracellular cellulases and a wild yeast Kluyveromyces marxianus isolated from termite was capable of producing alcohol. In Mexico, there are surpluses of cladode production and where it is essential to take advantage and use this carbon source for alcohol production due to currently fossil fuels depletion. Separate hydrolysis and fermentation (SHF), simultaneous saccharification and fermentation (SSF) and semi-simultaneous saccharification and fermentation (SSSF) for cellulase and alcohol production using Opuntia ficus-indica cladode as a unique carbon source was evaluated. In SHF process the best conditions for FPase activity (Filter paper activity for total cellulases) were 37 °C and pH 6.5 obtaining 0.67±0.02 U/ml and 0.61±0.03 U/ml for Acinetobacter pittii and Kluyveromyces marxianus, respectively. For alcohol production, the best conditions were 40 °C and pH 5.5 obtaining 12.95±0.3 g/L with K. marxianus while A. pittii did not produce significant alcohol concentration. Both processes were made with agitation (200 rpm). The SSF process was made with both microorganisms inoculated at the same time at 37 °C and without agitation. The maximum FPase activity of 0.28±0.004 U/ml and the maximum alcohol concentration was 7.5±0.27 g/L. Finally, an SSSF was performed, initially with A. pittii at 37 °C and after 8 h K. marxianus was then inoculated with temperature switched to 40 °C, the all process was performed without agitation. The maximum FPase activity was 0.45±0.001 U/ml, and the maximum alcohol concentration was 11.7±0.02 g/L. There was a significant difference (ANOVA) between SHF and SSSF in alcohol production. The best process for FPase activity and alcohol production is separate hydrolysis and fermentation using only yeast Kluyveromyces marxianus. Ethanol was the first biofuel produced from raw materials such as sugarcane and corn. 1 In order to produce biofuels, there was an interest in using lignocellulosic residues obtained from agricultural processes due to its high concentration of polymers such as cellulose and hemicellulose. 2 For this procedure, cellulosic biomass is first pre-treated (chemically or enzymatically) with the aim of breaking down the polymeric units and increasing the accessibility of sugars to fermenting microorganisms that produce alcohol. 3 Several processes have reported, a reduce of costs and enable the production of alcohol in an efficient and viable manner. 4 In separate hydrolysis and fermentation (SHF), the production of the enzymes, the saccharification of the biomass and the fermentation of sugars (hexose and pentose) are carried out in separate reactors. 5 But the accumulation of glucose and cellobiose during saccharification inhibits the cellulase activity and reduces its efficiency. 6 This disadvantage of the SHS process has permitted the development of simultaneous saccharification and fermentation (SSF) where both enzyme production and fermentation occur in the same reactor. 7 Different microorganisms like bacteria and yeasts perform both processes. The use of this scheme is to reduce the inhibition of cellulases because the sugars are consumed immediately by the fermenting microorganism. 8 The SSF process has some limitations as well, the cellulases and the fermenting microorganism usually have both different pH and working temperature, so it is essential to consider these conditions. Another disadvantage is that most of the microorganisms used for the fermentation of glucose does not use xylose (product of hydrolysis of hemicellulose). 9 With the aim of trying to reduce these disadvantages, SSF process has been modified to perform first the cellulases production with the best conditions of temperature and pH, and after eight h the fermenter microorganisms are added and switching the growing conditions so it can develop and carry out the process. This process has been called semi-simultaneous saccharification and fermentation (SSSF) and is also carried out in the same reactor. Due to these microorganisms capacities, the objective of this work was evaluated best conditions for three different schemes: separate hydrolysis and fermentation (SHF), simultaneous saccharification and fermentation (SSF) and semi-simultaneous saccharification and fermentation (SSSF) for cellulase and alcohol production using only Opuntia ficus-indica cladode as a unique carbon source. Six-month-old cladodes of Opuntia ficus-indica var Atlixco, were cut in 1 cm2 cubes and dried at 80 °C for 24 h, then milled to obtain a flour with a particle size of 1500 µm. The obtained flour was stored in plastic bags at 4 °C and kept in a dry place until further use. The isolation and identification of two strains were conducted: a bacteria was isolated from decaying cladodes, and yeast was isolated from termite stomach. Decaying cladodes were liquefied with sterile saline solution (proportion 1:2) while termite stomach was removed from several termites and homogenized with the same solution. The mixtures were serially diluted and an aliquot was spread on solid medium with 1% carboximetilcellulose as a unique carbon source. Microbial growth and cellulase induction were made at 37 °C for 24 h. Colonies were screened for cellulases activity by Congo test using a solid medium with 1% cladode flour (SCFM). The positive colonies with the maximum zone of clearance were picked and grown in fresh medium (nutritive broth for bacterium and YPD for yeast) and stored at 4 °C. Amplification and sequence analysis of the 16S rRNA gene was performed and microorganisms were identified as Acinetobacter pittii and Kluyveromyces marxianus. Both microorganisms exhibited cellulase activity and yeast presented fermentative capacity. For media preparation, cladode flour was used in a 20% concentration. A mixture of water and minerals I and II solutions were used. Mineral solution I: 0.6 % of K2HPO4 and mineral solution II: 1.2 % of NaCl, 1.2% of (NH4)2SO4, 0.6 % of KH2PO4, 0.12 % of CaCl2 and 0.25 % of MgSO4.7H2O. 10 The media was sterilized by autoclaving (121 °C/15 lb/15 min). For three different schemes, two steps were perform before the growth kinetics. The first step consisted of an adaptation growth in tubes containing 9 ml of 1% culture medium and 1 ml of strain preserved in glycerol at -20 °C and incubated at 37 °C, 200 rpm during four h. The second step was developed in 75 ml of 20% culture medium using the inoculum, growth at the same conditions during 16 h.
The process consisted of 250 ml of 20% of medium starting with 20x106 cell/ml. The hydrolysis was performed using Acinetobacter pittii at 37 °C, 200 rpm, pH 6.5 during 72 h. The fermentation was performed using Kluyveromyces marxianus at 40 °C, 200 rpm pH 5.5 during 72 h. Both processes were evaluated separately, and the conditions were the best obtained after a factorial design where temperature, pH and type of microorganisms were evaluated. The scheme was performed in 250 ml of 20% of medium starting with 20x106 cell/ml of each microorganism. Both, A. pittii and K. marxianus were inoculated at the same time, and the process was carried out at 37 °C, 0 rpm, pH 5.5 during 32 h.
For SSSF 250 ml of 20% of the medium was used starting with 20 x 106 cell/ml. The SSSF were carried out during 32 h. The bacteria growth during the first eight h at pH 5.5 and 37 °C and then the yeast was inoculated with a fixed temperature to 40 °C for 24 h. The SSSF was conducted without agitation during a final time of 32 h.
Direct count quantified populations (106 cell/ml) in a microscope of samples dilutions. Observations were made at 40X using Neubauer Brigh-line chamber with 0.1 µl capacity. Reducing free sugars (g/L) were quantified by dinitrosalicylic method at 550 nm 11 Alcohol (g/L) determination was made by potassium dichromate method at 585 nm. 12 The assay of FPase activity was assayed according to IUPAC 13 method by measuring the reducing sugars in a reaction mixture containing Whatman no. 1 filter paper (1x6 cm≈50 mg) as substrate. One unit of cellulase activity (U/ml) was defined by the formation of 1 µmol of glucose equivalents released per minute under assay condition. Results obtained (in duplicate) were analyzed using the software Statgraphics Centurion XVI for statistical significance of (p<0.05). After a factorial design where pH, temperature and type of microorganism (bacteria and yeast) were evaluated, the best conditions for FPase activity and alcohol production were established. That conditions were 37 °C and pH 6.5 with A. pittii and 40 °C and pH 5.5 with K. marxianus for hydrolytic activity and ethanol production, respectively. In Figure 1 the responses for A. pittii are presented. In Fig. 1A population and FPase activity have a maximum at 48 and 24 h, respectively. The maximum activity was of 0.67±0.02 U/ml, and it occurs at halfway of the exponential phase of growth. Acinetobacter genera are strictly anaerobe and can grow quickly in a range of 33-37 °C 14. The result is higher than the growth obtained for Acinetobacter anitratus in carboxymethylcellulose medium, with a value of 0.48 U/ml 15. 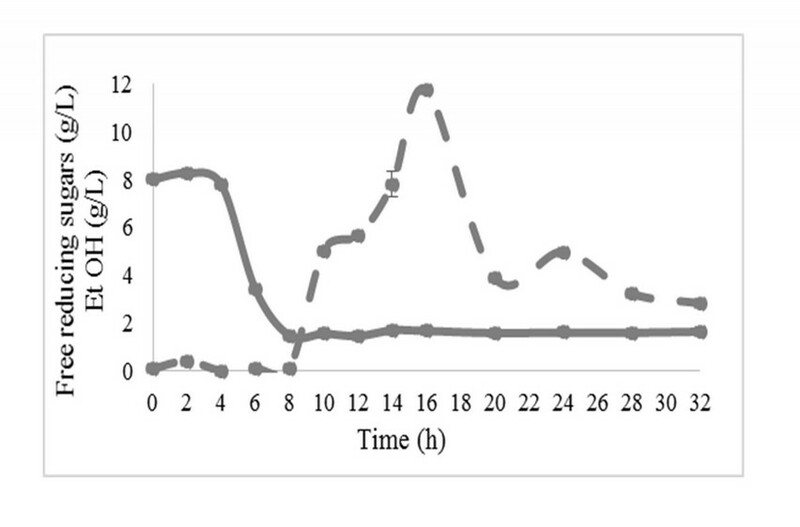 Free reducing sugars increased during the first 8 h and then decreased significantly (Fig. 1B). This increase is due to a hydrolysis step while the decrease is due to the consumption of sugars for growth because alcohol production was not notable. For K. marxianus the results are presented in Figure 2. As we can see, the population of yeast is exponential through first 48 h and a maximum FPase activity is obtained at 24 h (Fig. 2A), with a value of 0.26±0.03 U/ml. This result is lower than the obtained for the bacterium; this behavior is because yeast consumes the sugars available in the medium for alcohol production instead of enzyme production. The maximum alcohol concentration was 12.95±0.03 g/L and was obtained at first 8 h. This corresponds to half the value obtained from Opuntia ficus-indica cladode fermentation using the same strain after chemical hydrolysis (25 g/L) at 40 °C after 48 h 16. According to the results obtained after SHF processes with the aim to produce higher alcohol concentration, processes were developed with microorganism is grown together at different times following the SSF and SSSF schemas. In Figure 3, the results of simultaneous saccharification and fermentation process are presented. The growth of A. pittii was higher than K. marxianus during all time, meaning that bacterium use carbon source most efficiently than yeast, the population in this process is lowest than obtained in the separation process may be because yeast growth was inhibited by bacterium growth. FPase activity has a maximum at ten h and corresponds to 0.28±0.004 U/ml (Fig. 3A); this value decreased twice in comparison with separate hydrolysis. Free reducing sugars depletion was observed at first 6 h and then production was quantified due to cellulase activity. Alcohol production was observed at eighth with a maximum of 7.5±0.07 g/L (Fig. 3B). In Figure 4 growth and FPase activity of the SSSF process are presented. In this process, bacterium had the highest growth too with poor growth of the yeast (Fig. 4A). After six h a decrease in population of A. pittii was observed and a stationary phase was presented. At this time K. marxianus was inoculated (8 h). As we can see in Fig. 5 bacterium was capable of assimilating free sugars presented in the medium for growth during the first four h, and then a depletion on concentration was observed. At the same time, the bacterium used that carbon source for enzyme production and then hydrolyzed polysaccharides for sugars release. In Fig. 4B) the maximum FPase activity was 0.45±0.005 U/ml and was observed in stationary phase at 10 h, when total sugars were used for alcohol production. The maximum reached at 16 h (just 8 h after yeast inoculation) was 11.70±0.02 g/L of alcohol concentration. After this maximum, concentration decreased. This behavior could be because the microorganisms consumed the alcohol like carbon source for maintenance or for organic acids formation. The two microorganisms analyzed grew satisfactorily in the culture medium added with cladode flour with the proposed fermentation schemes. It was observed that Acinetobacter pittii bacteria had higher growth compared to yeast. Likewise, the highest total cellulase activity was obtained in separate hydrolysis and fermentation process. The highest alcohol production was obtained in separate hydrolysis and fermentation process too, with Kluyveromyces marxianus yeast. The decrease in the concentration of the total reducing sugars in the schemes along the kinetics was associated with an active fermentation for the conversion of sugars to alcohol. This work was supported by the National Council of Science and Technology of Mexico (CONACYT) and Secretariat of Agriculture, Livestock, Rural Development, Fisheries and Food (SAGARPA) with project No. 195157. The author López-Domínguez thanks to National Council of Science and Technology of Mexico (CONACYT) for scholarship No. 265844. 2. Kitani O, Hall CW. Biomass handbook. New York, USA: Gordon and Breach Science Publishers; 1989. 963 p.
10. Atlas R. Handbook of microbiological media. 3rd edition. CRC Press. 2004. 1153, 1155 p.